The Chicago Botanic Garden is one of our favorite places to visit. We have been there in the winter, spring, summer and fall, and found that with the changing seasons there is always something new to see. But this year we stopped by in November, on a day that fell in between fall and winter. The pleasure that we found in this visit revealed a bit of the magic behind the scenes: the staff at the Chicago Botanic Garden actually works very hard to make sure that there is always something special for their repeat visitors to see. It would have been easy to write off the importance of the few people walking around the gardens on this grey day. After all, there was lots to do to set up for the Christmas season’s Wonderland Express now that the Night of 1,000 Jack-o-Lanterns had come down. A full calendar of special events like these is an important part of the Chicago Botanic Garden’s efforts to bring visitors back regularly, just like a retail store’s annual holiday open house, street festival or after-Christmas sale. Although there was nothing very special going on the day we stopped by, the gardens were well groomed, with the leaves raked up and some hardy mums and cabbages providing color. 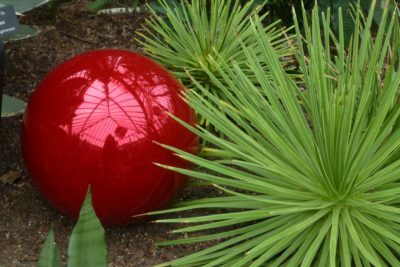 Inside the greenhouses big red globes added a bright touch during a time when very little is in bloom. The gift shop and restaurant were open and welcoming. Hopefully your shop has customers who come in frequently, perhaps even weekly, even when you don’t have a special event going on. What do you do to surprise and delight these regulars? Have you set up a new display, moved some existing items around, or decided to focus on a line of merchandise that may not have gotten much attention before? The fact that our social media feed is constantly hungry for new material serves as a reminder that our shops need to have change happening all the time. In order to inspire and delight customers, both old and new, you can’t let your shop get stagnant.– boredom is the enemy of a great shopping experience. Plan to start every week with some change, large or small, to continuously create some excitement for your staff and especially for your loyal repeat customers.